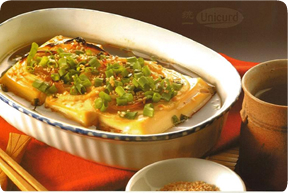 Cut tofu into 4 pieces, drain off excess water and place in a casserole. Cut onion into round thin strips and place on top of tofu. Mix soy sauce and mirin together and pour over tofu.Bake at 180 degree Celsius for about 20 minutes. 4. Sprinkle sesame seeds and garnish with spring onion and bonito flakes.